Please select a Type & Size to view availability. Ideal for road or track use, the Dainese Manis D1 Back Protector offers CE level 2 impact protection, articulated external plates and comfort padding. Sizing is dependent on both torso length and chest circumference. Height is measured from your shoulders to your natural waist, which will determine which Type is necessary. Chest circumference is measured at the widest point around your chest, usually just under the arm pits. Note: Depending on size, Back Protector will have more or fewer segments than image shown. I'm trying to find a back protector for a while I was looking at fly racing Stryker vest but sizes unclear and people's reviews said that they are too short and didn't offer enough protection so I began researching again and found that dainese offered sizes for chest size and length which made sense to me since half the world is fat and short but I'm skinny and tall. So get the tape measure out measure your chest and your back and you won't be disappointed!!!!! This back protector offers great protection. It has made putting my suit on difficult. It keeps riding up my back as I try to pull the suit over my shoulders. Needed one for my first track day and purchased this along with my suit. Fits good with the Velcro adjustable band. I have two issues that may overlap. Since there is only a stomach band and two straps that go over the shoulder there isn’t anything that holds it in place. When putting on a suit it slides up and I need a second person to shove it back down so my suit can slide over it. Other than that I have no issues with it. It feels good under my suit and I feel confident in the protection it will provide in an accident. I like the feeling that its like your not wearing anything and the flexibility it gives your mouvements. Once straped it keeps well in place and does not move so this is definetly a bang for the buck. Highly recommend. Sizing is spot on if you follow the guidelines. Comfortable (forget you're wearing it) and fits under my Leguna Seca D1 suit without any issues. You can remove the waist straps but not the shoulder harness. I had read a review of someone mentioning the straps being bulky which worried me as I wanted it primarily to wear under a very tight fitting, aggressive suit. The straps are no issue at all! Wear it everyday and would buy it again. Comfortable, easy to wear and easy to put on and take off. I feel more confident while I wear this back protector than when I used to wear my insert back protector. This back protector is a must! I use it everywhere I ride. It's comfortable and feels great. Had the wave back protector for about 15 years, took one heavy highside while wearing it (hit a kangaroo...yes I am not joking) at about 80-90kmph. The wave worked well, but the aluminium in the protector itself deformed a little as designed. It was only minor but I felt it was time for an upgrade. The Manis is, in a word, awesome, comes right down to my tail bone and feels solid and is held in place well by an excellent design overall. Articulates as it should. Now I should point out I ride a dyna fat bob now, but I am not always just cruising so it is nice to have the protector move with me as I move around the bike. Don't mind that it comes over my jeans (Rukker of course), but under my full leathers it is of course totally fine. Personally I prefer to have one good back protector and wear it whether I am in full leather or just jeans and a vest. Always have good gloves, good shoes, helmet and back protector as the bare minimum even when it is boiling hot outside. Just buy it, it may save your life or serious injury and a totally comfortable and well made product. This back protector is the perfect balance of style, protection, functionality and flexibility. It has good air flow and great comfort. 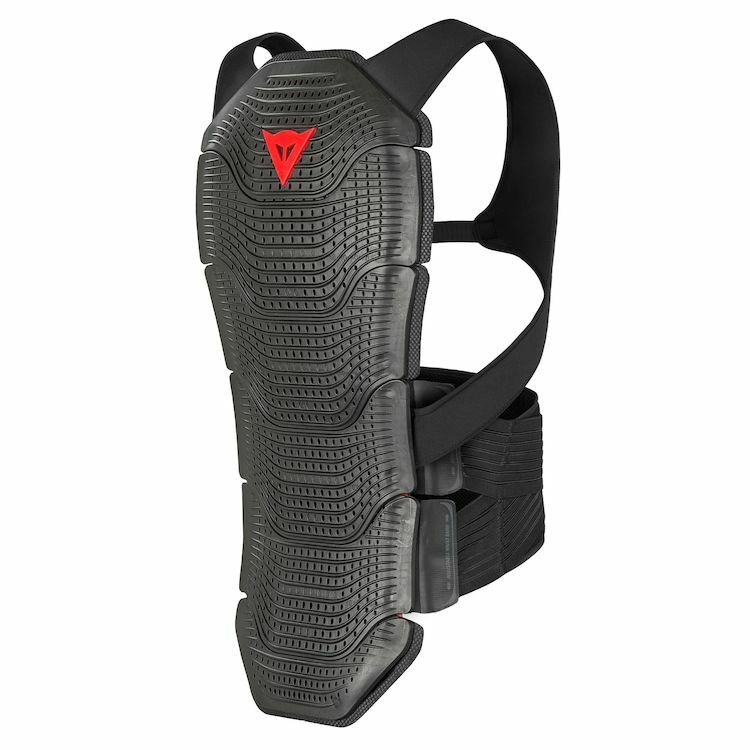 I purchased the Dainese Mantis D1 back protector for use on the track. I was very impressed with the build quality of the back protector. After eight hours at the track, it is evident that a lot of thought and research went into the design of this product. It is the perfect balance of style, protection, functionality and flexibility. It has good air flow and great comfort. I highly recommend this product. Needed a back protector for the track and I want to ride knowing I have the best protection. Chose the Manis D1 based on reviews and personal experience. Great ergonomics, felt comfortable and helped in low side. Cause how much is your way of life worth to you?? this is also my second set. unfortunately, my first set is out of the country and it's a pain to bring back and forth so I just bought another one. manis will protect me at the track in case i go down & i needed the best , Also i liked the straps help keep every thing together so if i take off track suit manis wont flop backwards like other one you offer !!! The one I bought previously was to big so I need to buy a smaller one. Awesome back protector. Takes some trial and error to get it on with the full suit setup, but it's well worth it. I've been crashing in Dainese for almost ten years and 100,000 miles of riding, can't even remember the model. Stealth maybe? Hoping the shoulder straps will keep the back protector centered in my suit. To replace a 15 year old Dainese wave back protector that has taken a few get offs. The manis seemed like the best pick of all the back protectors, and I like the stand alone version so I can use it with different jackets and also cover my lower back a little better. It seemed like the best back protector. I wanna what is the deference between this D1 and the normal Manis? Can you tell me, what is the difference between this protector and Dainese Manis ? What is new about it ? BEST ANSWER: I believe it is just the CE certification. Unless they changed something to get it certified. Would you race in this? If not what would you choose? I'm sure you could, but I'm probably not qualified enough to answer that. However personally I would check out the combinations that combine both quality back protectors and also chest protectors in one piece of kit. Which one is better between this and dainese pro armor? BEST ANSWER: Better is subject to interperitation. I own this one and not the pro but i did some research just now: this one has a hard plastic shell with a cushion interior (certified to the same standard as the pro). The pro seems to be a single layer of material that acts both as a shield and a shock absorber. My problem with that is that its not a full shield. Theres PLENTY of rocks that could reach you through those gaps. Other than that id say the pro soubds more breathable or maybe has a better fit? Would this create a need for a slightly larger jacket size on something like he super speed d1? BEST ANSWER: It's really not meant to be worn with a jacket. It would definitely fill in space and make the fit tighter, but comfort would probably depend on your body frame. So if the jacket is fitted to you body already then I would recommend a slightly larger size. Also be aware that the manis is longer then the jacket and will stick out from the bottom. can it be used with Dainese D-Air Misano Perforated Race Suit?